Amidst all the hustle and frustrations in life there are some random inspiring moments that just make our day. And when it comes to that, there is no better thing than Heartwarming Photos that can explicitly translate those moments into something we can hold on to. Heartwarming photographs ranging from bonding after years of separation to just a random act of kindness are some of the pictures that make our list. “Dear Mr & Mrss Clause Thank you for putting me on the good list every year. I have decided that this year I don’t need any presents from you. Instead, I am going to do a walk for charity. Please can you give my toys to the children that don’t have any Love Emmileah xxxxxx”. In Rio De Jenioro a good old man offers his shoes to a homeless girl. A $1 Bill might not be a great act of philanthropy but it sure is an act of kindness when attached on a random vending machine with a beautiful note. 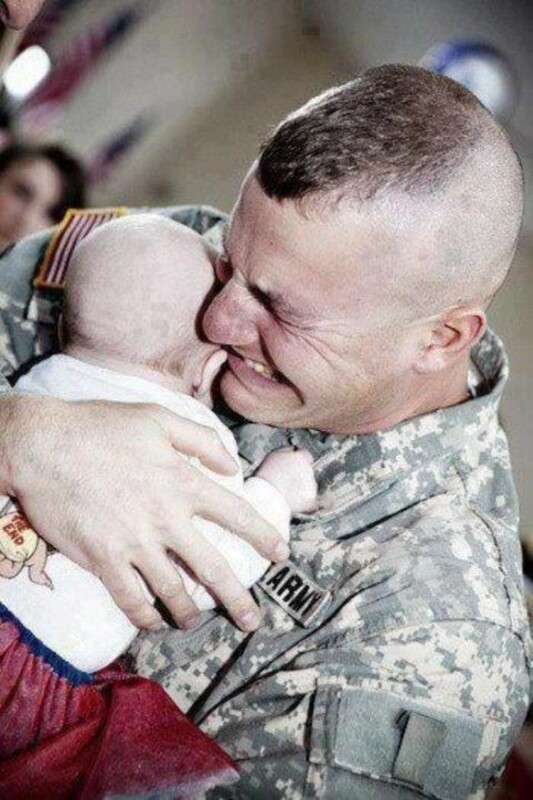 This photo captures the meeting moment of a U.S Army Soldier with his baby after coming back from Iraq, and apparently has a lot of emotions interwoven in every minute detail. A Mexican man wipes away his tears of happiness after winning Gold in the Paralympics. Who knew a group of shaved heads could stand so firmly for humanity. 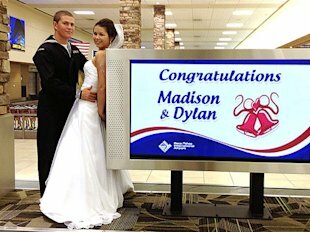 An onspot marriage, after long service separation, with a high school sweetheart, could very well be the best thing that can happen on an Airport. A good samaritan left drinks and breakfast for this homeless guy. A Shih Tzu hurles into rough water and a young passerby dives right into it to rescue him for a stranger. Finding a $20 bill is one thing and then donating it due to impracticalities of finding a rightful owner is a completely different thing. Helping unemployed people to get a cleaner outfit for an interview, greed definitely is not a driving force for this place. A group of people decide to lift a man on wheelchair so that he could see his favorite band perform. Keeping all the cultural and territorial differences aside, this Afghan man offers tea to a thirsty U.S soldier. A Turkish confectionery store offers free bread for those in need. A very rare scene to witness in a sprint race; Megan Vogel helps her injured competitor to cross the line. 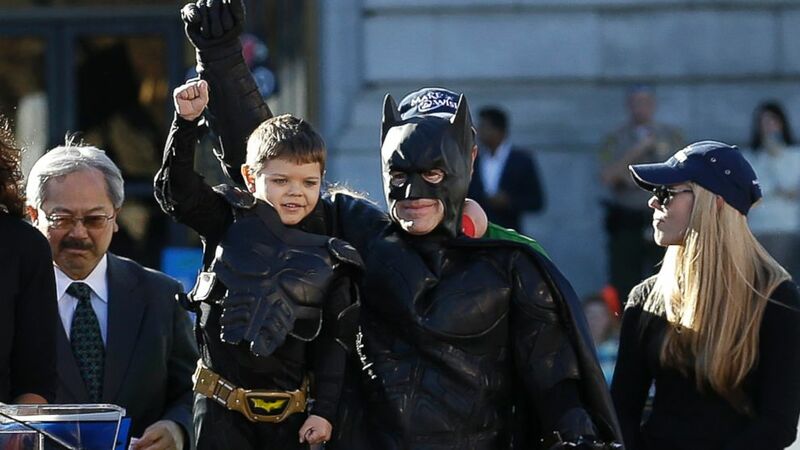 Make-A-Wish Foundation sponsored this leukemia suffering child’s dream to be a Batkid by transforming San-Francisco into Gotham city with all the villains and thrills of Batman Comic. Sometimes, animals can be equally affectionate. This couple has crossed every cultural, territorial and religious boundary just to be together. Lockers are the oldest means for bullying, but this group of students took time to post 600 such notes on different lockers to help everyone feel good about themselves. A mom dives on the floor, hugs her child tightly and rejoices every moment of it while reminiscing about all the time she spent away from her baby. This heartwarming photo reminds us of the fact that even the most elite are strung by the simple thread of daily beautiful moments. Two boys make a human chain to rescue a stray dog. A book is one of the few best things you can give to any person, and this store not only sells it at reduced price but also lends it for free to people on low budget. This brave resident of Little Ferry, New Jersey saved his neighbours during Hurricane Sandy attack using his personal Jet Ski. This affectionate father runs in a local triathlon every year with his 13 year-old daughter suffering from cerebral palsy. A boy pours his share of clean water to those in need. John Unger’s 19-year old dog Schoep suffers from arthritis and John cradles his dog every night in lake superior so that the buoyancy of water can alleviate his pain. This boy probably knows things better than most of the adults.